Diffusion-weighted imaging (DWI) is a well-established magnetic resonance imaging (MRI) method for diagnosing cerebral ischemia. DWI is a routine protocol in most institutions that perform neuroimaging; normal states and abnormal conditions are easily interpreted through the use of DWI in conjunction with the use of apparent diffusion coefficient (ADC) imaging by correlating findings of hyperintensity on DWI images with findings of hypointensity on ADC images (see the images below). [1, 2] Imaging and interpretation of water diffusion have improved with the development of diffusion tensor imaging (DTI). DTI allows direct in vivo examination of aspects of the tissue microstructure. DTI takes advantage of diffusion anisotropy to provide excellent details of the brain; for example, it enables mapping of the orientation of the white-matter tracts. 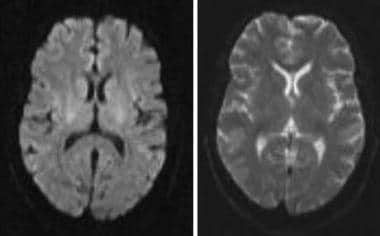 Normal brain appearance in axial DWI (left) and ADC (right) images in a 35-year-old man. 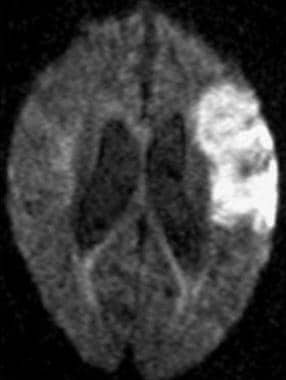 Axial DWI image demonstrates a typical wedge-shaped, cortical-based, hyperintense lesion in the left temporoparietal lobes consistent with acute infarct. 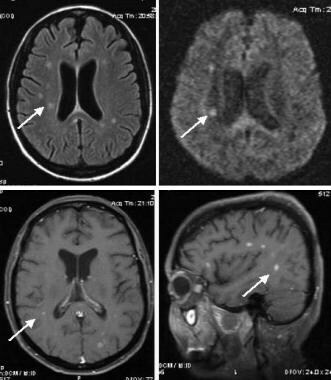 Axial fluid-attenuated inversion recovery (FLAIR) image (top left), diffusion-weighted image (DWI) (top right), and axial and sagittal T1-weighted (T1W) images (bottom) in a 40-year-old man with a history of intravenous drug abuse and fever demonstrate multiple enhancing focal brain lesions in the gray-white matter junction (arrow) compatible with septic emboli. The lesions are hyperintense on both FLAIR and DWI images. 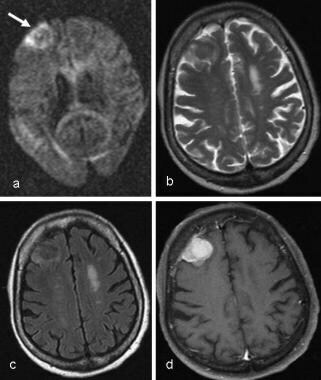 Axial diffusion-weighted image (DWI) (top left), T2-weighted (T2W) image (top right), fluid-attenuated inversion recovery (FLAIR) image (bottom left), and contrast-enhanced T1W (bottom right) image demonstrate a right convexity meningioma, which appears hypointense on DWI image. The perilesional brain edema (arrow) is hyperintense on T2W and DWI sequences. 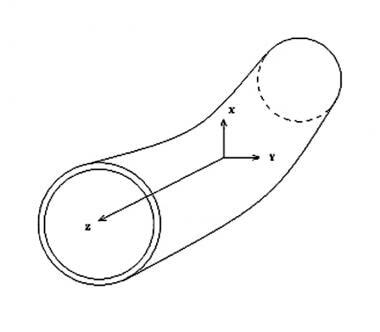 Diffusion ellipsoid. Three eigenvectors are demonstrated, with the principal eigenvector along the Z direction. Courtesy of Dr Andrei I. Holodny, MD. On DWIs commonly used to diagnose acute stroke (see the image below), diffusion is described by using the apparent diffusion coefficient (ADC). This is sufficient for pathologies in areas such as gray matter, where diffusion is usually isotropic. To measure the presence of anisotropy in the white matter requires a tensor D, which describes the mobility of molecules in a particular direction and correlation between these directions. The tensor is symmetric; at least 6 elements are required to characterize it. The diffusion ellipsoid defines the magnitude and direction of the diffusion of water molecules in each voxel in the brain. The tensor may be diagonalized such that 3 elements, called eigenvalues, remain along the diagonal. Three eigenvalues — lambda 1, lambda 2, and lambda 3 — are derived. DTI allows clinicians to look at anisotropic diffusion in white-matter tracts, but it is limited in its ability to demonstrate spatial and directional anisotropy. Advanced methods such as color coding and tractography (fiber tracking) have been used to investigate directionality. The eigenvector corresponding to the largest eigenvalue, termed the principal eigenvector, defines the main direction of diffusion of water molecules in that voxel (see the image below). Mapping the principal directional eigenvectors in each of the voxels forms the basis for tractography (see the images below); the assumption is that the principal eigenvector is aligned with the direction of the fiber bundle. On these images, the fibers are given different colors by their direction of diffusion: blue for superior and inferior; green for anterior and posterior; and red for left and right. 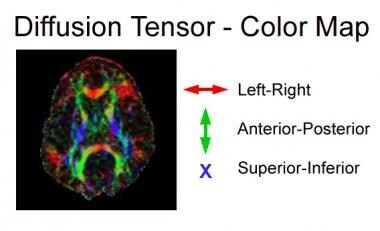 Axial tractographic image demonstrates white-matter tracts in the brain in the left-right (red), anterior-posterior (green), and superior-inferior (blue) directions. Courtesy of Dr Andrei I. Holodny, MD. Coronal tractographic image demonstrates various nerve-fiber tracts. Courtesy of Dr Andrei I. Holodny, MD. Brain MRI should be performed with a 1.5- or 3-T MRI machine. High gradient strength in the range of 20-60 mT/m with a slew rate of 120 T/m/s is ideal. Typical parameters for a single-shot spin-echo echo-planar imaging (EPI) sequence are a repetition time (TR) of 6000 ms, an echo time (TE) of 100 ms, and a field of view of 24 cm to obtain 3- to 5-mm axial or coronal sections with a 5-mm intersection gap. The acquisition matrix is 96 × 96 with a reconstruction matrix of 128 × 128. The images are obtained by using 4 linearly increasing b values in 6-7 noncolinear directions (bmax = 703-1000 s/mm2). In addition, a T2-weighted (T2W) image is obtained without diffusion weighting (b = 0 s/mm2). Maps of both FA and RA may be presented as gray-scale images. Maps of mean diffusivity and FA may be generated by using Pierpaoli and Basser's method on a pixel-by-pixel basis. Regions of interest (ROI) are placed on both maps to calculate diffusivity and FA. FA is sensitive to low values of diffusion anisotropy; VR is sensitive to high values of diffusion anisotropy; and RA is linearly scaled for different levels of anisotropy. Both FA and RA vary from 0 (isotropic) to 1 (anisotropic). The values of measurements in pediatric brains markedly differ from those in adult brains; values vary with increasing age. Mean diffusivity is approximately 0.7 X 10-3 in adults and 2 X 10-3 in neonates. Because anisotropy is greater in ordered structures, such as myelinated axons, DTIs provide useful information regarding the myelination of white matter. FA and ADC may vary independently. This may be explained by the fact that damaged or malformed brain has glia and neurons, respectively. Therefore, they have enough cell density to prevent effects on ADC; however, because of the disorganization, FA is reduced. Diffusion-weighted imaging (DWI) and DTI have been extensively used to detect acute ischemic brain injury (see the image below). A common cause of epilepsy is mesial temporal sclerosis or hippocampal sclerosis in patients with chronic epilepsy. Findings seen on DTIs include increased diffusivity and decreased anisotropy caused by the loss of structural organization and expansion of the extracellular fluid space. Changes in DTI may also extend to areas of the brain that appear morphologically normal on conventional MRIs. In this way, the DTI may define the true extent of pathology and improve preoperative planning. Refractory extratemporal neocortical epilepsy may be caused by malformations in cortical development (MCD); these malformations may not be apparent on conventional MRI. However, differences in ADC in the affected region, as compared with the contralateral normal brain, may be seen; this helps in presurgical planning. However, DTI may erroneously depict regions of presumed seizure onset by showing subtle structural abnormalities caused by head injury or ischemia. DTI has demonstrated a potential in distinguishing gliomas and solitary metastasis in the brain parenchyma. Significantly higher mean diffusivity and lower FA, as compared with levels in normal-appearing white matter, have been demonstrated in the peritumoral regions of both gliomas and metastases. Diffusional anisotropy is present in dysmyelinating disorders such as Pelizaeus-Merzbacher disease; by contrast, it may be lost in demyelinating disease such as Krabbe disease or Alexander disease. Also, in contrast to relatively high signal intensity of the lesions of Krabbe disease on DWI, the lesions in Alexander disease have signal intensity. Therefore, DWI is clinically useful in differentiating dysmyelination from demyelination, as both have lesions of high intensity in the white matter, as shown on T2-weighted images. Souillard-Scemama R, Tisserand M, Calvet D, Jumadilova D, Lion S, Turc G, et al. An update on brain imaging in transient ischemic attack. J Neuroradiol. 2015 Feb. 42(1):3-11. [Medline]. Hakimelahi R, Vachha BA, Copen WA, Papini GD, He J, Higazi MM, et al. Time and diffusion lesion size in major anterior circulation ischemic strokes. Stroke. 2014 Oct. 45(10):2936-41. [Medline]. Bammer R. Basic principles of diffusion-weighted imaging. Eur J Radiol. 2003 Mar. 45(3):169-84. [Medline]. Le Bihan D, Mangin JF, Poupon C, et al. Diffusion tensor imaging: concepts and applications. J Magn Reson Imaging. 2001 Apr. 13(4):534-46. [Medline]. Mori S, van Zijl PC. Fiber tracking: principles and strategies - a technical review. NMR Biomed. 2002 Nov-Dec. 15(7-8):468-80. [Medline]. Sundgren PC, Dong Q, Gómez-Hassan D, Mukherji SK, Maly P, Welsh R. Diffusion tensor imaging of the brain: review of clinical applications. Neuroradiology. 2004 May. 46(5):339-50. [Medline]. Shenton ME, Hamoda HM, Schneiderman JS, Bouix S, Pasternak O, Rathi Y, et al. A review of magnetic resonance imaging and diffusion tensor imaging findings in mild traumatic brain injury. Brain Imaging Behav. 2012 Jun. 6(2):137-92. [Medline]. Cavaliere C, Aiello M, Di Perri C, Fernandez-Espejo D, Owen AM, Soddu A. Diffusion tensor imaging and white matter abnormalities in patients with disorders of consciousness. Front Hum Neurosci. 2014. 8:1028. [Medline]. [Full Text]. Moseley ME, Cohen Y, Kucharczyk J, Mintorovitch J, Asgari HS, Wendland MF. Diffusion-weighted MR imaging of anisotropic water diffusion in cat central nervous system. Radiology. 1990 Aug. 176(2):439-45. [Medline]. Qiao PF, Shi F, Jiang MF, Gao Y, Niu GM. Application of high-field magnetic resonance imaging in Parkinson's disease. Exp Ther Med. 2017 May. 13 (5):1665-1670. [Medline]. Fragata I, Canhão P, Alves M, Papoila AL, Canto-Moreira N. Evolution of diffusion tensor imaging parameters after acute subarachnoid haemorrhage: a prospective cohort study. Neuroradiology. 2017 Jan. 59 (1):13-21. [Medline]. Takahashi H, Ishii K, Kashiwagi N, Watanabe Y, Tanaka H, Murakami T, et al. Clinical application of apparent diffusion coefficient mapping in voxel-based morphometry in the diagnosis of Alzheimer's disease. Clin Radiol. 2017 Feb. 72 (2):108-115. [Medline]. Drake-Pérez M, Boto J, Fitsiori A, Lovblad K, Vargas MI. Clinical applications of diffusion weighted imaging in neuroradiology. Insights Imaging. 2018 May 30. [Medline]. Miller JH, McKinstry RC, Philip JV, et al. Diffusion-tensor MR imaging of normal brain maturation: a guide to structural development and myelination. AJR Am J Roentgenol. 2003 Mar. 180(3):851-9. [Medline]. Pierpaoli C, Basser PJ. Toward a quantitative assessment of diffusion anisotropy. Magn Reson Med. 1996 Dec. 36(6):893-906. [Medline]. Mandl RC, Schnack HG, Zwiers MP, van der Schaaf A, Kahn RS, Hulshoff Pol HE. Functional diffusion tensor imaging: measuring task-related fractional anisotropy changes in the human brain along white matter tracts. PLoS ONE. 2008. 3(11):e3631. [Medline]. Uda S, Matsui M, Tanaka C, Uematsu A, Miura K, Kawana I, et al. Normal Development of Human Brain White Matter from Infancy to Early Adulthood: A Diffusion Tensor Imaging Study. Dev Neurosci. 2015 Mar 17. [Medline]. Zou K, Huang X, Li T, Gong Q, Li Z, Ou-yang L, et al. Alterations of white matter integrity in adults with major depressive disorder: a magnetic resonance imaging study. J Psychiatry Neurosci. 2008 Nov. 33(6):525-30. [Medline]. Wu M, Chang LC, Walker L, Lemaitre H, Barnett AS, Marenco S, et al. Comparison of EPI distortion correction methods in diffusion tensor MRI using a novel framework. Med Image Comput Comput Assist Interv Int Conf Med Image Comput Comput Assist Interv. 2008. 11:321-9. [Medline]. Bammer R, Auer M, Keeling SL, et al. Diffusion tensor imaging using single-shot SENSE-EPI. Magn Reson Med. 2002 Jul. 48(1):128-36. [Medline]. Pipe JG, Farthing VG, Forbes KP. Multishot diffusion-weighted FSE using PROPELLER MRI. Magn Reson Med. 2002 Jan. 47(1):42-52. [Medline]. Bammer R, Augustin M, Strasser-Fuchs S, et al. Magnetic resonance diffusion tensor imaging for characterizing diffuse and focal white matter abnormalities in multiple sclerosis. Magn Reson Med. 2000 Oct. 44(4):583-91. [Medline]. Yang Q, Tress BM, Barber PA, et al. Serial study of apparent diffusion coefficient and anisotropy in patients with acute stroke. Stroke. 1999 Nov. 30(11):2382-90. [Medline]. Sundgren PC, Edvardsson B, Holtas S. Serial investigation of perfusion disturbances and vasogenic oedema in hypertensive encephalopathy by diffusion and perfusion weighted imaging. Neuroradiology. 2002 Apr. 44(4):299-304. [Medline]. Lu S, Ahn D, Johnson G, Law M, Zagzag D, Grossman RI. Diffusion-tensor MR imaging of intracranial neoplasia and associated peritumoral edema: introduction of the tumor infiltration index. Radiology. 2004 Jul. 232(1):221-8. [Medline]. Filippi M, Agosta F. Diffusion tensor imaging and functional MRI. Handb Clin Neurol. 2016. 136:1065-87. [Medline]. Commowick O, Fillard P, Clatz O, Warfield SK. 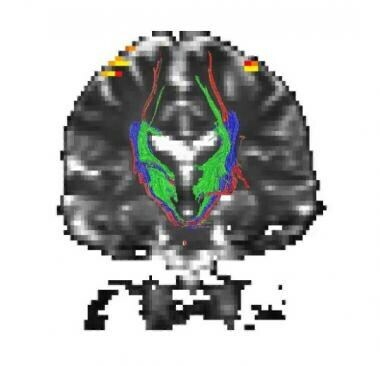 Detection of DTI white matter abnormalities in multiple sclerosis patients. Med Image Comput Comput Assist Interv Int Conf Med Image Comput Comput Assist Interv. 2008. 11:975-82. [Medline]. Ono J, Harada K, Mano T, et al. Differentiation of dys- and demyelination using diffusional anisotropy. Pediatr Neurol. 1997 Jan. 16(1):63-6. [Medline]. Bammer R, Acar B, Moseley ME. In vivo MR tractography using diffusion imaging. Eur J Radiol. 2003 Mar. 45(3):223-34. [Medline]. Wang VY, Lam HI, Ennis DB, Young AA, Nash MP. Passive ventricular mechanics modelling using MRI of structure and function. Med Image Comput Comput Assist Interv Int Conf Med Image Comput Comput Assist Interv. 2008. 11:814-21. [Medline].